pinocchio's blue fairy. — halthegal. faerie tale feet piece inspired by the blue fairy in carlo collodi's pinocchio. 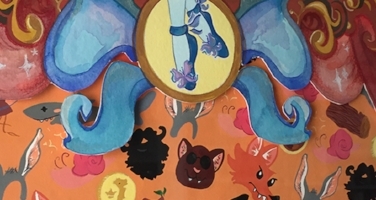 i’ll show you the process of painting this faerie tale feet piece, and then below share with you all the shapes hidden in the background from the original stories/book. because we all know pinocchio as a marionette who was forced to perform with no strings for the puppet show, i wanted for the first time to create a 3-d shadowbox piece imitating the theatre stage. so here’s the beginnings of the proscenium with the blue fairy’s feet featured in the center. here are 4 of the 5 layers to the original piece. the stage curtains and proscenium, the stage lights, the stage, and monstro and the waves trying to once again engulf the fleeing pinocchio, gepetto, cat, and goldfish. once the layers were done, i needed to paint the background pattern. so this is how i transfer it- with my pattern drawing on a piece of tracing paper taped to my illustration board… and then pressing down with my ink-less hello kitty pen with transfer paper in between to leave grey lines i can paint around. because i use gouache as an opaque medium, i have to paint the background color in one sitting. thankfully i have a magnifying lamp that helps me see around all those tiny shapes as i paint around each icon for literally hours on end… so here are the first few minutes, beginning in the top left corner of my board! here’s zoomed out for a bit of scale. the orange square (background pattern painting) is 11″ square. and yes, i mix my paints on paper plates. here’s a view of my tins full of gouache tubes and the pieces all painted and read to be framed together in 3d…! here’s a detail shot of the blue fairy flying over the background! and here is the final pieces of the painting all framed together. it’s so beautiful in real life, i wish you were in my living room/studio to see it…! so what’s hiding in the background from carlo collodi’s original tale? the gold coins that the fox and cat convinced pinocchio to bury so a tree would grow with more coins on it- i painted italy on the gold coins and marked the town of “collodi” with a tiny dot- collodi was the village in tuscany where the author’s mother was from, not his real name. the devious fox who repeatedly tricked pinocchio and lead him to do naughty things and even hung him at one point. and tried to get him eaten by a giant serpent… i tell ya, the book is just awful! a headband of donkey ears for Playtime Land (or Pleasure Island) where the boys are turned into donkey slaves and sold at auction. the golden locket pinocchio sees on the blue fairy (who’s really a dead ghost girl with blue hair) at the circus where he’s been performing tricks as a donkey. i think that’s all i got in there! i recommend the film over the book. but curiosity would well be quenched with this crazy piece of children’s literature. original framed piece available for $575. contact me to inquire! greeting cards and signed limited edition prints available on my etsy site.